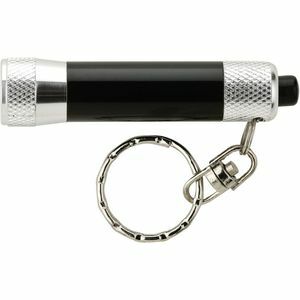 The Marina Key Light has a single white LED light with a metal split key ring. Simply push the button to turn the power on or off. The Thumbs Up! Key Light has a single white LED light and a metal split key ring. Simply squeeze to turn on the light. Outdoor visibility shoe clip with on/off power button for blinking or steady mode. Easily clips to the heel of your shoe when running cycling or walking. The Pull Key Light is a single white LED bulb shaped key light with a pull on and off power switch. The Carabiner Key Light features a single white LED light and push power button to turn itself on and off. A metal split ring is not included. The Double LED rectangular Key Light has 2 white LED lights and a metal split key ring. Simply squeeze to turn on the light. The Round LED Key Light/Bottle Opener is a metal bottle opener with a white LED key light. Simply squeeze to turn on the light. The Mini Bottle and Can Opener/Key Ring opens bottles and flip top cans and comes with a metal split key ring. The Deluxe Bottle Opener opens bottles and flip top cans and comes with a metal split key ring. The Metal Whistle/Key Ring is a metal split key ring. The Oval Key Light is a single white LED light with a metal split key ring. Simply squeeze to turn on the light. The Cosmic Key Light features a single white LED light and a metal split key ring. Squeeze the power button to turn on the light. The Lantern Carabiner Light features 3 white LED lights and can be used as a flashlight or lantern. Slide the power switch to turn it on and off. 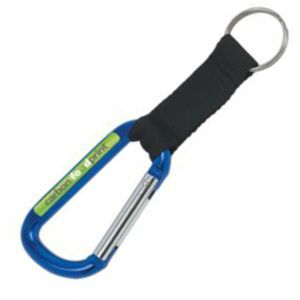 Carabiner key ring features colored polyester webbing and an aluminum plate for imprints. 6mm carabiner. Split metal key ring. Metal key ring features a shiny, metal imprint panel and a metal split key ring. This Lemon keychain with bottle opener can easily open bottles and features a metal key ring.